Stealth: ? No. Writes Diffinity.exe.log to AppData folder. 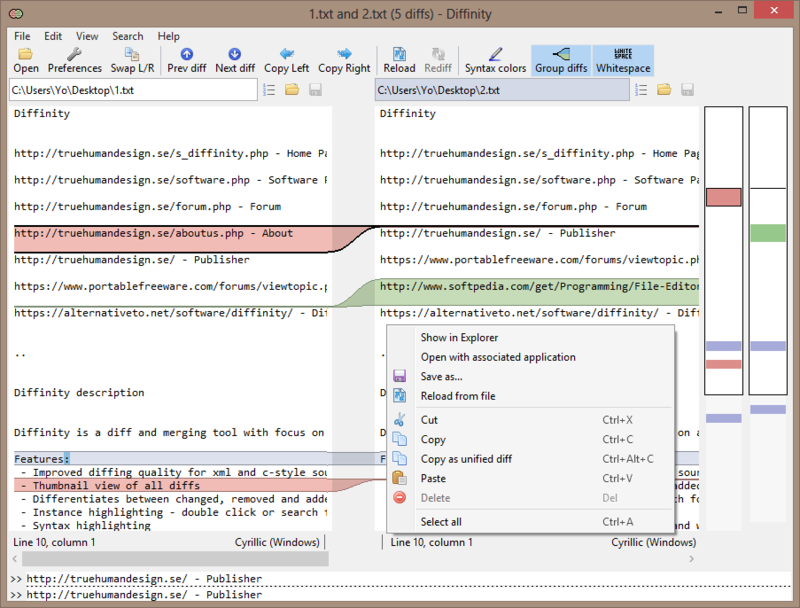 WinMerge is a visual text file differencing and merging tool. It can be used to determined what has changed between project versions, and then merging changes between versions. It comes with a built-in editor with syntax highlighting, line numbers and word-wrap, and handles DOS, UNIX and MAC text file formats. X-WinMerge is a portable wrapper for WinMerge. Alternatively, WinMergePortable is also available. How to extract: Download the ZIP package and extract to a folder of your choice. Launch X-WinMerge.exe. I've had this program on my computer for several years without having a real need for it. Knowing the nature of what it does and some of my projects, it was there just in case. Well, today I screwed up a script (evidently what one browser thinks is commented isn't something other browsers agree upon) and this helped me fix it quickly and easily. An excellent program. 64bit version from https://sourceforge.net/projects/winmerge/files/alpha/2.15.2/ can be used to replace 32 bit folder in PortableApps.com version. So far no problems with it. Renamed original file, just in case. PAFUser: For a better experience, use WinMerge 2011 Portable. WinMerge 2011 is a continuation fork of WinMerge that is regularly updated. Our portable package includes the 32-bit and 64-bit versions and switches between them. 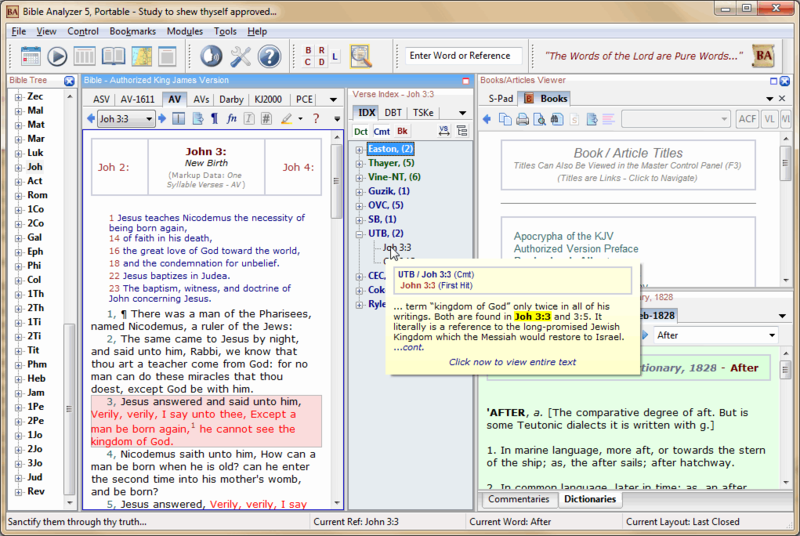 Bible Analyzer is a cross-platform study and analysis program with text comparison, proximity searches, detailed statistics, and more usually not found in other free or commercial software programs. and I really like the Hymns Audio folder..nice touch. Text Compare is a simple tool for comparing text files (ini, txt, html, xml) and marking differences by color. Includes drag-and-drop support, filtering, view of new, moved and copied lines and different comparison methods (just show new and changed or moved and copied). How to extract: Download the ZIP package and extract to a folder of your choice. Launch TextCompare.exe. Save settings to ini file. The website link for this one gives a 404 error, and the download link gives an error message saying a password is required. "The below listed tools are no longer available as download on this website. As of today, all information about these 3 tools is also no longer available on this website." So unless there is an alternate download location for this app, I guess it's gone. 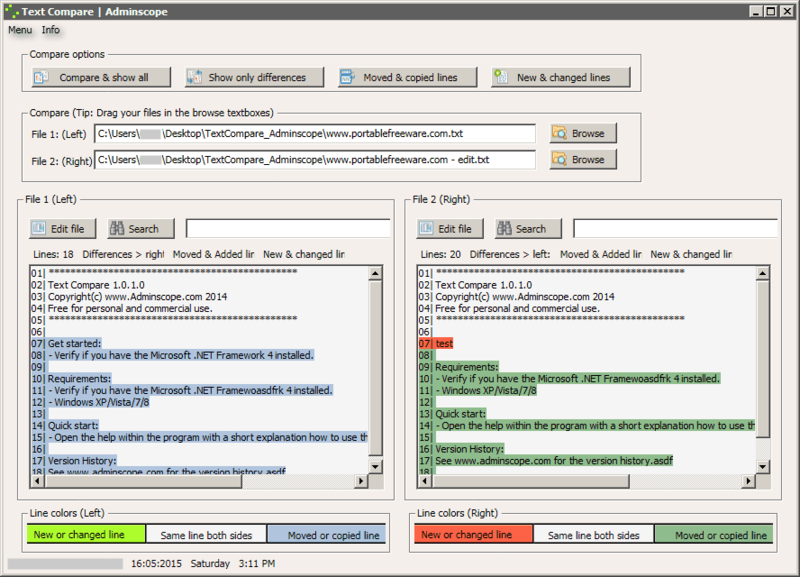 TextDiff is a text and folder comparison tool. It supports drag-and-drop of files, customizable color highlighting of differences, two-way merging, in-place text editing, etc. CAUTION: Writes corrupt files on my XP sp3 setup. in Unicode BigEndian UTF-8, which spoils my day somewhat. I checked carefully and re-downloaded etc for a few days now. May not effect everyone. Hope this helps someone avoid a problem. I cannot open the .hlp file. Any suggestions? TextDiff.hlp is a windows 3.x Help file. Under Win XP, Explorer will open it just fine. but does suggest to download some sort of conversion utility. Alternatively, TextDiff.hlp file contents could be converted (under winXP) to a PDF document. PM me with your email if you want it.